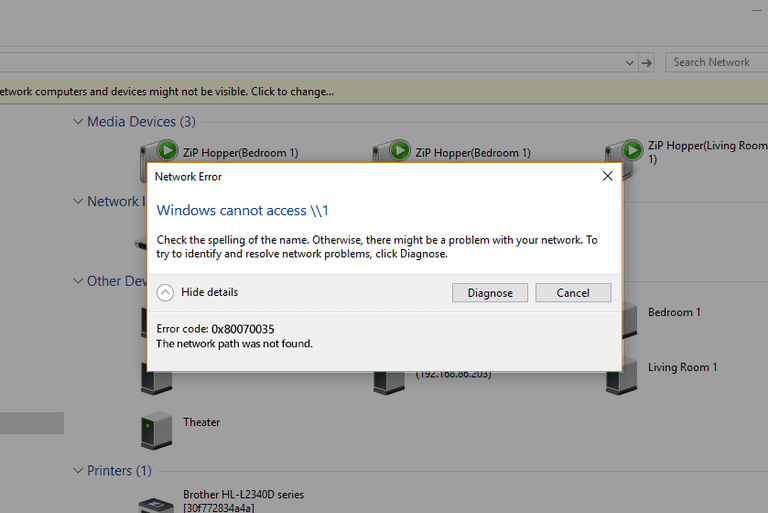 Any of several different and unrelated technical problems on a network generate this error. Steps and problems differ depending on whether you're using a corporate-grade server to share documents, standard Network File Sharing in Windows, or the Windows HomeGroup networking feature. Use valid path names. Error 0x80070035 rears its ugly head when the network is working as designed but people mistype the network path name. The path specified must point to a valid shared resource on the remote device. Enable sharing on the remote device. When the remote device isn't configured to share files or printers, you'll never get a connection. Verify that file and printer sharing is active on the remote computer, or if necessary, turn this feature on. Verify that the user account has permissions to the remote resource. On the remote computer, right-click the file then select the Properties option. Ensure that the user or group enjoys the required privileges (minimally, read) to access the file. Click the Edit button to modify the permissions. Synchronize watches. Unusual system behavior including the network path was not found errors can occur when computer clocks are set to different times. Keep Windows devices on a local network synchronized using Network Time Protocol wherever possible to avoid this problem. Disable local firewalls. A misconfigured or misbehaving software firewall running on the initiating Windows device may interfere with local file sharing. Temporarily disabling firewalls, either the built-in Windows Firewall or vendor-supplied firewall software will help you figure out if a firewall's preventing your network from sharing properly. Home desktop computers protected behind a broadband router firewall do not need their own firewall at the same time for protection, but mobile devices that are taken away from home should keep their firewalls active. Reset TCP/IP. Although most people need not get involved with the low-level technical details of how an operating system works, power users like to be familiar with the advanced troubleshooting options available. A popular method to work around occasional glitches with Windows networking involves resetting the components of Windows running in the background that support TCP/IP network traffic. resets TCP/IP on Windows 8 and Windows 8.1. Rebooting the operating system after issuing this command returns Windows to a clean state. Reboot all devices. You may find value in rebooting all affected devices — the host and client computers and the network router. It's possible that cached data in one of the links of the networking chain prevents the network transaction from successfully completing. Although file- and printer-sharing technologies for Windows computers has advanced considerably over the years, this solution tends to put the onus of knowing basic networking principles upon you. If you're not comfortable troubleshooting networking problems, consider using a cloud storage service like Microsoft OneDrive, Google Drive, or Dropbox to share your files instead.